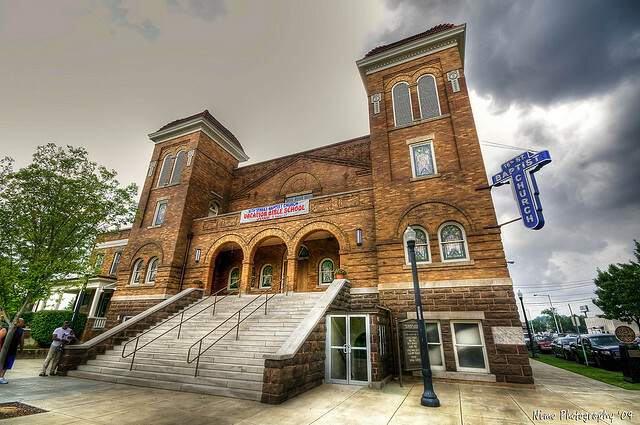 Tonight I will be speaking in a sacred space – the 16th Street Baptist Church. 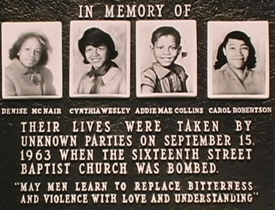 That’s where nineteen sticks of dynamite killed four little girls — Denise McNair, Addie Mae Collins, Cynthia Wesley and Carol Robertson . All these years later I still remember their names as easily as John, Paul, George and Ringo. Denise, in particular stands out in my mind. In her photo she looks like a little brown skinned Jackie Kennedy with a pillbox hat and matching cloth coat. I remember those girls because they were sainted in our home. I’m sure ours was not the only household that deified the “Birmingham Angels” who had awakened a nation’s conscious as they soared toward heaven. Other than the monthly arrival of Ebony magazine, I rarely saw little black girls in the pages of magazines or newspapers. Pictures of those four little girls –Denise, Addie Mae, Cynthia and Carol — were the most widely publicized photographs of black children in the early nineteen sixties when I was forming ideas about the world, and my self identity. We talked about the bombing in our home and prayed for the girls AND the men who set off the blast as my parents tried to pass on the “love they enemy credo.” I was raised in Minnesota but my father hailed from Birmingham and the bombing touched our household in painful ways. But my family also took great pains to make sure Birmingham would not just be a place of tragedy — a place where children lost their lives because of hatred. They made sure we were surrounded by a cocoon of love and and high expectations when we visited by grandparents on trips down south. They spun a web that was woven with hope instead of hatred and resilience instead of retribution. And while we talked openly about the Birmingham Angels, lifting their names up in prayer at the table, we did not talk openly about tragic events in our own family. 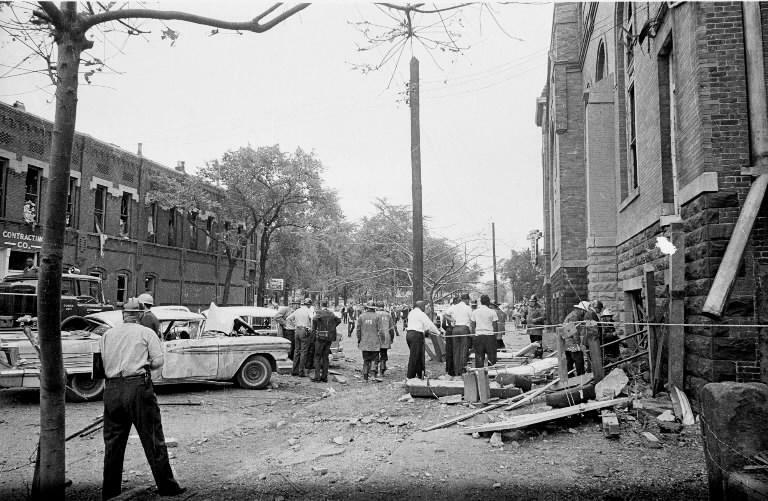 The blast at 16th Street Baptist Church reverberated around the globe. It was a turning point in the civil rights movement and reminder for my parent’s generation to focus all their energy on getting somewhere better fast. With all deliberate speed, they rushed forward and stopped glancing over their shoulder at the pain they were eager to leave behind. Sprinters know to keep their eye on the finish line…in this case, their eyes on the proverbial prize. I never dreamed that I would be invited to speak in the sanctuary on 16th street. I tremble to think of what it will feel like to stand at the front of that room, in the same chamber where Martin Luther King once Stood, the same spot where the minister was set to deliver a sermon called “The Love that Forgives” when the blast tore through his building at 10:22 a.m. When I step in that building, I will think of those two words. Love and Forgiveness. They stand as powerful tent poles in life. But I will also think of a third word this evening. Courage. Not just the gumption I will need to find words that will do justice to lives touched and lives extinguished on that September day. I will also think of my parent’s courage in standing up for what they believed in, and remaining largely silent about their struggles because they believed it was the right thing to do. I will also ask those who join me this evening to now summon the courage to look back at a painful history — not with anger, but with wonder at how so many people managed to swallow their rage and instead arm their children with hope.